Although traditionally called Nikko and Gakko, these clay statues (746) may actually represent Brahma and Indra. They flank a large Fukukenjaku Kannon (next page) in the Sangatsu-do of Todai-ji. 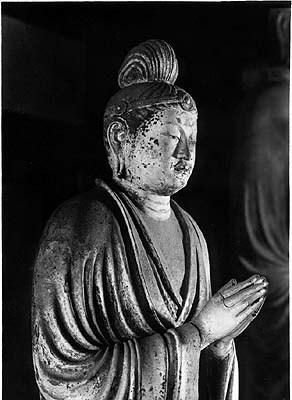 At 7 1/2 feet in height, the statues are larger than life size, although they are still dwarfed by the 12-foot high Kannon. Nikko is the Bodhisattva of Sunlight, and Gakko is the Bodhisattva of Moonlight. 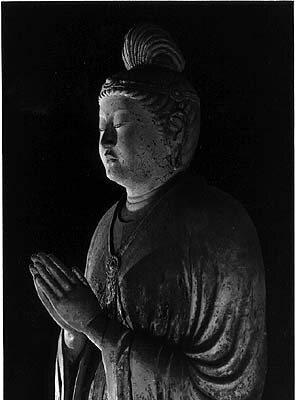 Usually they appear as attendants of Yakushi, rather than Kannon. It can be difficult to tell the two apart: differences in dress, placement (right or left of the main image), and iconography (inner or outer arms raised) are not always consistent. Here in Todai-ji, as well as To-ji and Yakushi-ji, Nikko is to the viewer's right and Gakko is to the viewer's left; in Kakuon-ji (Kamakura), Nikko is to the viewer's left and Gakko is to the viewer's right.